Maasa-chan, you're famous among the fans for your mother-like position, but Okai-chan unexpectedly has that character as well. Sudo: I often get told by the other members that I'm like the oneechan, but (Sugaya) Risako has been calling me 'Mama, mama' from way back. Also, I'm told that my bearing is like an older lady, so I can't help but seem that way (laughs). Okai: Inside Berryz Kobo, you're definitely level-headed, and the way you choose your words is extremely polite. Even when you guys line up at concerts to give your thoughts about the performance, you're the only one who picks her words nicely. It's so powerful and moving that you could say it's like an election address (laughs). You're really like a mother. Sudo: Rather than saying that Chisato is motherly, I'd say that she's pretty caring. If there's someone who isn't doing well, you'd immediately rush up to them, asking if they're doing alright. You're really caring. Okai: Oh, thank you for that. I've got lots of siblings, so I think that it's easy for me to notice if something's happening to someone in a crowd. I'll end up immediately empathising. When someone's worrying, I'll worry together with them. When they're mad, I'll be mad together with them. Sudo: Though I've got a sister as well, which means that I'm the oneechan at home, entering Berryz made me think that I had to sharpen up. Plus, I think that being called the mother might have led me to my current personality. Okai: During the auditions, I wanted to be a guy (laughs). Okai: In the past, we innocently coloured our hair. The other day, when I was looking at pictures from the H!P Kids days, I was thrown off by Maasa-chan's dyed hair. As you are now, I can't see you dyeing your hair. Chisato-chan, from your eyes, has Maasa-chan become cheerful? Sudo: Ah, that's right (laughs). Okai: At the time, the choreographer Natsu (Mayumi)-sensei told me to make her laugh, since Maasa hardly ever smiled (laughs). So at the PV shooting, I was more enthusiastic about getting Maasa to laugh than I was about how I looked on-camera! The part where Maasa turns around and laughs was used in the PV (laughs). Sudo: I was shy back then, so I couldn't really express myself well. Such things happened, huh. 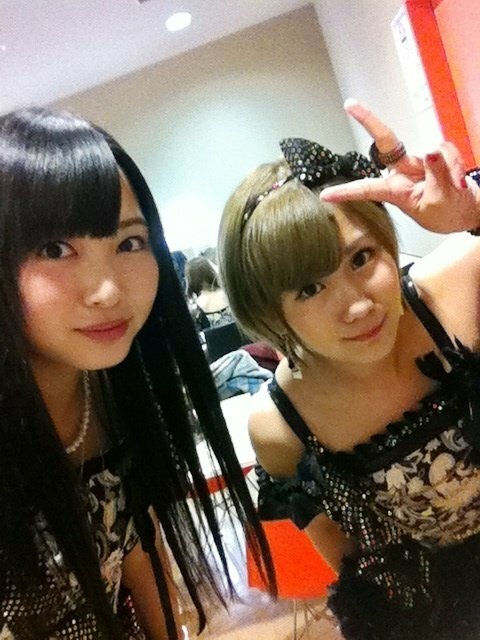 Maasa-chan, from your eyes, has Chisato-chan grown up? Sudo: Chisato was the girl who could make me smile naturally, so I wasn't shy with Chisato. I opened up my heart to her from the very start. Okai: I've gone to Maasa's place once. I had a completely enjoyable time (laughs). Sudo: You did (laughs). Chisato came over to my house on our way back from work. Okai: When that happened, apparently her father had just got out of the bath. So when I greeted him with a 'Good evening', he was a bit startled since he had just got out of the bath. Maasa-chan apologised to me after that (laughs). Sudo: He didn't know that you were dropping by. And even though he'd just got out of the bath, he did have pants on (laughs). Okai: We used to hang out with Maasa-chan's brother in the past as well. I'd like to see your mother again; it's been ages. Ten years in the future, what sort of woman do you think the other will be like? Okai: Maasa-chan mentioned this the other day, but since Maasa will turn twenty before me, I'd like her to tell me where the good stores are once I hit twenty. I kind of feel that I'm with Maasa-chan, I can drink without feeling insecure. Chisato-chan, you're fully ready to get drunk and have Maasa-chan look after you (laughs)? You know, if Maasa-chan's driving, she can't drink (laughs). Sudo: For Chisato's sake, I'll get a licence, and hold back by drinking oolong tea (laughs). Maasa-chan, as for you, what sort of woman would you like Chisato-chan to become? Sudo: If you're asking me what I feel will happen, I think she'll become even more womanly. And then she'd become a wonderful mother, and I'm sure that she'd have some boys among her children (laughs). Okai: Ah, I get that often (laughs). Sudo: It kind of floated up in my mind (laughs).